Berwick-upon-Tweed: Printed and sold by R. Taylor, et al. The Battle of Flodden, in Northumberland, took place on the 9th of September, 1513. England, ruled by Henry VIII, was invaded by King James IV and his Scottish army. Described as the ‘last great medieval battle in the British Isles’, the weaponry used were generally close combat pieces, like these swords. 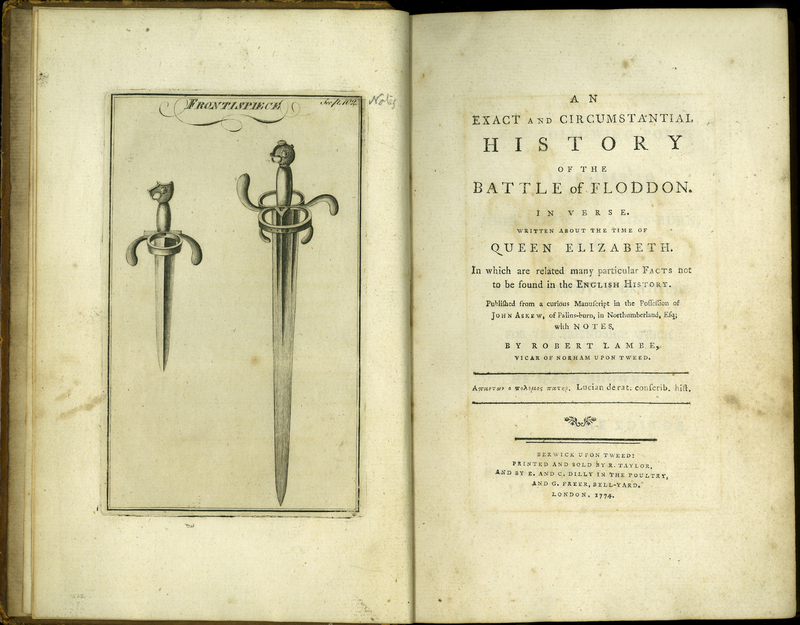 The frontispiece to this historical verse displays a ‘draught of the sword and dagger of K. James, taken from the originals’. The Scots lost to the English, and King James was killed in battle. There can be no mistake that the engraved image above is a frontispiece. It sits to the left of the title page and it even states that it is! Robert Lambe, “An Exact and Circumstantial History of the Battle of Floddon,” ourheritage.ac.nz | OUR Heritage, accessed April 20, 2019, http://ourheritage.ac.nz/items/show/10715.